In the 9 months the Brant Advocate has been publishing I have been proud of much that we have been able to do. Some of our goals with this publication were to change the narrative of our communities and to help others amplify the interesting and important stories that they have. We wanted this to be a platform for diverse opinion and diverse experiences. In those efforts, though we are young, we have seen some success. As a professional working in this community over a number of years in health care and mental health for both children and adults, I’m very proud of how often stigmatized subjects have been covered in these very pages. Mental health is a scary subject for many. I have worked with families who shudder at the idea of seeking helpful services for a loved one. It is a hard journey for many to reach out for help and it is a hard journey for many who struggle for years never knowing where to find help. Very early on in the creation of this publication, as we were developing our team of contributors, it amazed me how many of them wanted to speak directly or indirectly about mental health. Those of you reading this, who are also in the helping fields or have had your own difficult experiences with mental health, know what it can be like. The stigma, and the fear, that you or a loved one will be seen as weak, incapable or less than is strong. Yet in these pages, in a short period of time, we’ve seen people with lived experience of mental illness and allies with a keen interest write factually and passionately about the subject. Tough articles about personal experiences with suicide, addictions, depression, seasonal affect disorder, postpartum depression, and post traumatic stress disorders have all been covered in the Advocate. And that’s how we change the narrative. If we talk about mental health as we would any other subject of interest – factually, passionately and consistently we will see, over time, less stigma and more understanding, less barriers and more doors. According to the Canadian Mental Health Association 20% of Canadians will personally experience a mental illness in their lifetime. It affects Canadians of all strata regardless of age, education, income and culture. We have 3.2 million teens in this country who are at risk of developing depression, and our youth suicide rate is the third highest in the industrialized world. If we can’t talk about it, we’ll not move forward. So it is imperative that we do talk about it. Let me share an example from one night in Brantford. One of the first things I helped to organize in this community, as a professional, was an Open Forum on Mental Health that was a precursor event to that year’s Mental Health Week activities. We had many speakers share their own experiences and discuss services there for those who might need help. I remember vividly speaking to a young woman during the break who approached me with a nervous smile that quickly turned to tears. She was feeling very depressed and had no idea where to turn until she came to the forum event. She had heard about the forum in The Expositor and thought it would be a low risk way to see if there might be help out there for her. She expected it to be a waste of time and to end up back home feeling as alone as ever. Except when she heard others with lived experience of mental illness speaking about their journey she didn’t feel alone. There was help available and she was able to connect with it that night. I’ve seen a similar story unfold time and again at these awareness events, at health fair tables, at places where community outreach exists and at every local Mental Health Week I’ve been able to be a part of. Each May, Brantford and the surrounding area participates in Mental Health Week. This holds a special place in my heart as I actually started my career in mental health in this community on May 4th, 2009, which was the day of the 2009 Mental Health Week Kick-off. This year, I will be emceeing that same event and I’ve been happy to be a member of the Mental Health Week Committee each year since and have seen it grow and adapt to the needs of our community. 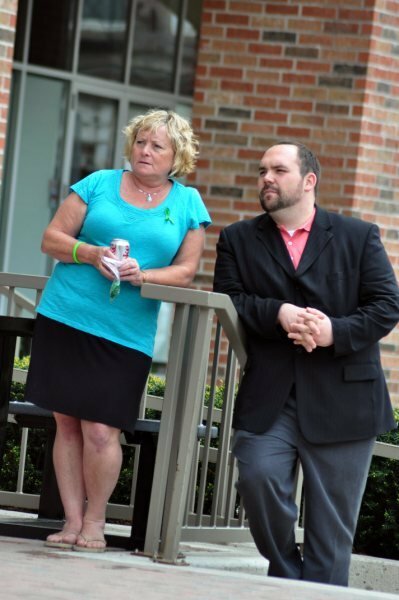 Photo: Marc with Mental Health Consumer Advocate Karyn Graham during the 2010 Mental Health Week Kickoff in Brantford. I hope you’ll check out the schedule below for a complete listing of events for Mental Health Week 2012 and that you’ll be on the lookout for these events every year. In the meantime, if you or someone you know needs information on where to get help, dial 211 on your phone or visit www.211ontario.ca to be connected to help right away. – Thursday, May 10th Six Nations Child & Family Services will be holding a Mental Health Family Fun Fair, from 5-7 p.m. at the Social Services Gym, 15 Sunrise Court, Ohsweken. There will be agency displays, activities for children, food and beverages and prizes. For more information, call Roger Vyse at 519-445-2950. Well said Marc. You words are like milk and honey. An elixir of life. I'm trying to get the word out about a drumming and deep relaxation circle that is being offered from St. Leonard's Community Services. I will be facilitating this and doing a small pilot study to see how valuable this may be to the Brantford Community. It is for EVERYONE, not just those with mental illness or addiction problems. Participating together in a fun, collaborative way dispels the myths and false beliefs that permeate our society when it comes to mental illness. We want to light up the stigma with good grooves, energizing grooves and deep, soothing sound meditation.